Protests continued in Ferguson and St. Louis after a grand jury decided Monday not to indict the police officer who killed Michael Brown. 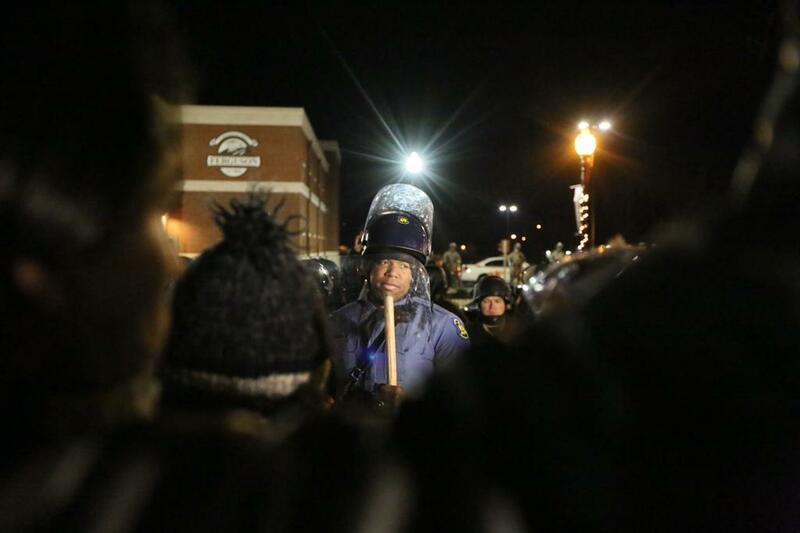 Joel Anderson and Jim Dalrymple II are reporting from Ferguson for BuzzFeed News. A man walks past the burned out remains of a business burned after the grand jury verdict in Ferguson, Missouri, on Wednesday. A St. Louis County grand jury cleared Officer Darren Wilson of charges in the August shooting of unarmed black teen Michael Brown, a decision that inspired protests around the nation. Michael Brown's parents talked about Darren Wilson calling him "a murderer" who was bent on killing someone. Officer Darren Wilson has spoken to the media for the first time. Peaceful standoff right now in #Ferguson: Police behind barricades on one side of the street, and protesters on the other. 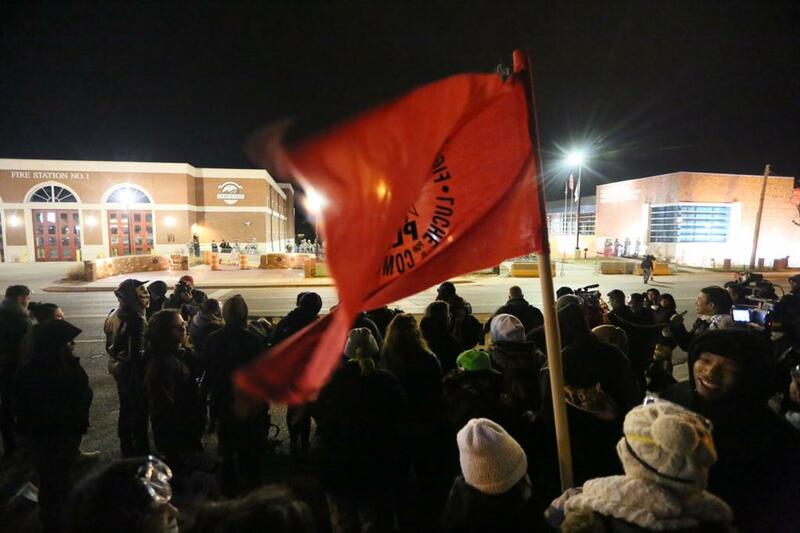 Communist chant has subsided in #Ferguson. Moments ago: "Can't stop! Won't stop! Till killer cops are in cellblocks!" 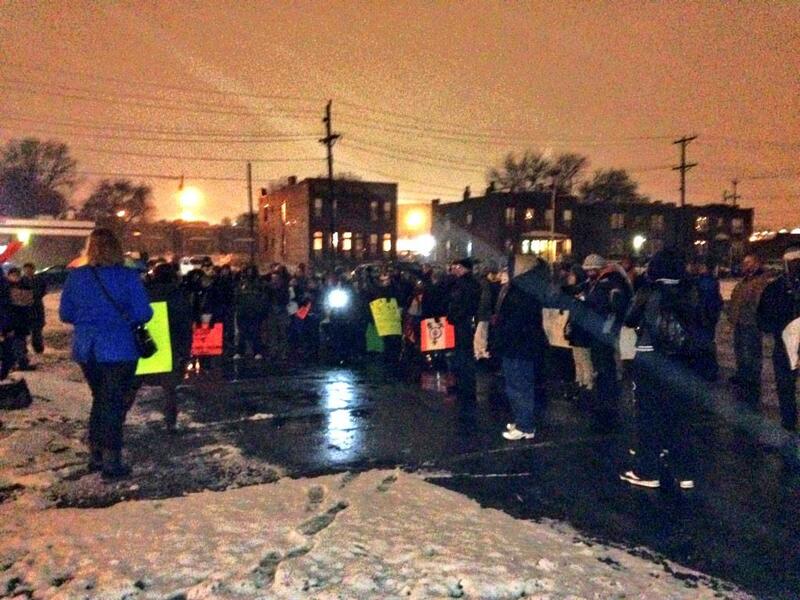 Police said protesters were illegally blocking West Florissant Avenue. Several people were arrested and taken into custody outside of the police station Friday. On Friday, Gov. Nixon called for a special legislative session to provide funding for the Missouri National Guard and the Missouri State Highway Patrol in Ferguson and St. Louis. Ferguson took a break from protests Thursday after days of at-times violent clashes with police in the wake of a grand jury's decision in the Michael Brown case. 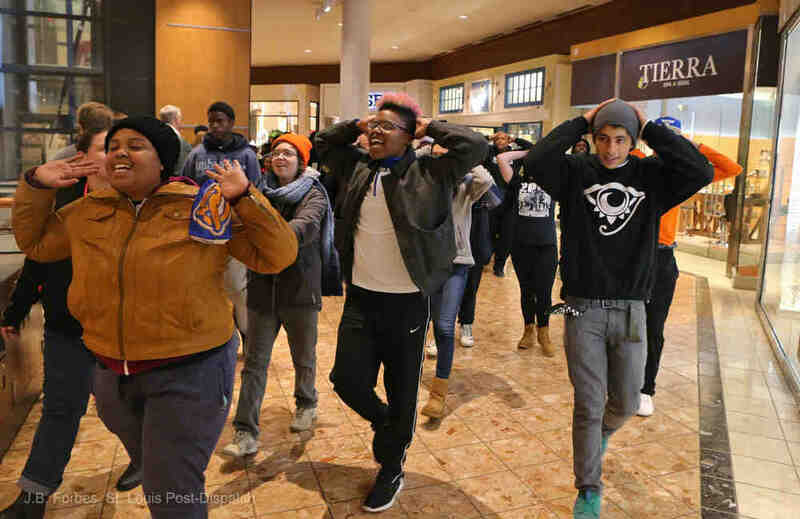 Protesters were "peacefully disruptive" in the St. Louis Galleria, as cold weather gripped Ferguson. Jim Dalrymple II reports. 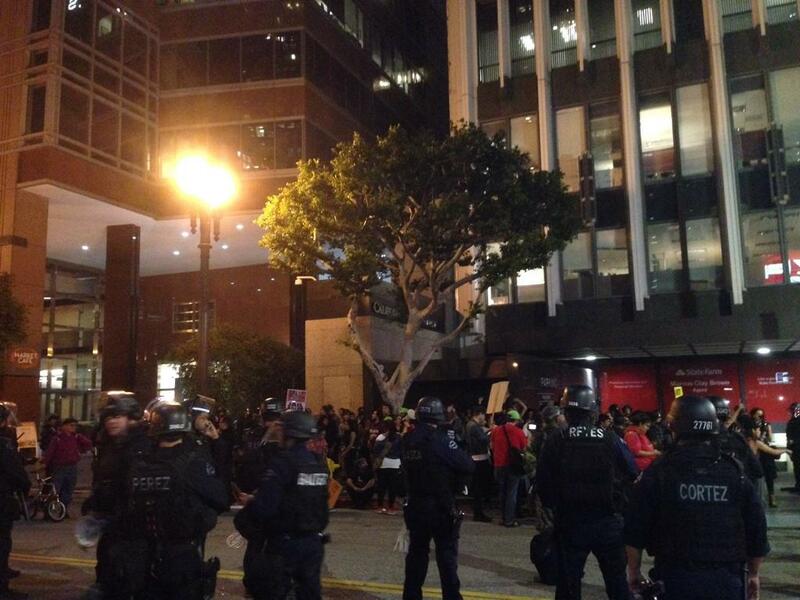 About 130 protesters were arrested Wednesday night in Downtown Los Angeles after police declared the demonstration an unlawful assembly, KNBC reported. Police made the mass arrest on protesters after an hours-long march through the downtown area. "When they will no longer comply with our requests and when it becomes dangerous, when they start running in and out of cars and put the public at risk, then we have to take action," LAPD Chief Charlie Beck told the Los Angeles Times. Police in Los Angeles prepared to arrest a group of protesters who failed to disperse after officers ordered them out of downtown. The protesters were surrounded, and a bus arrived to take them to jail. LAPD transport bus has arrived. 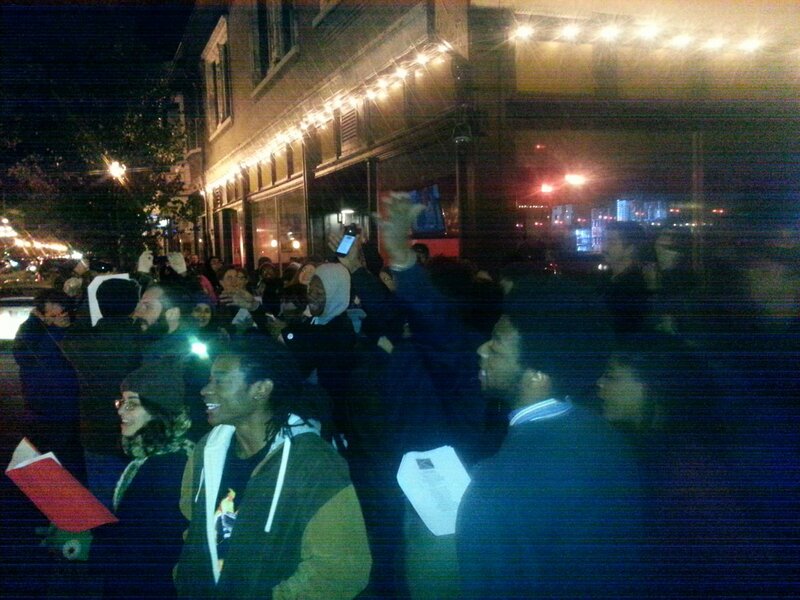 #MichaelBrown #Ferguson Protesters are surrounded on hope and sixth. The protesters were methodically arrested. 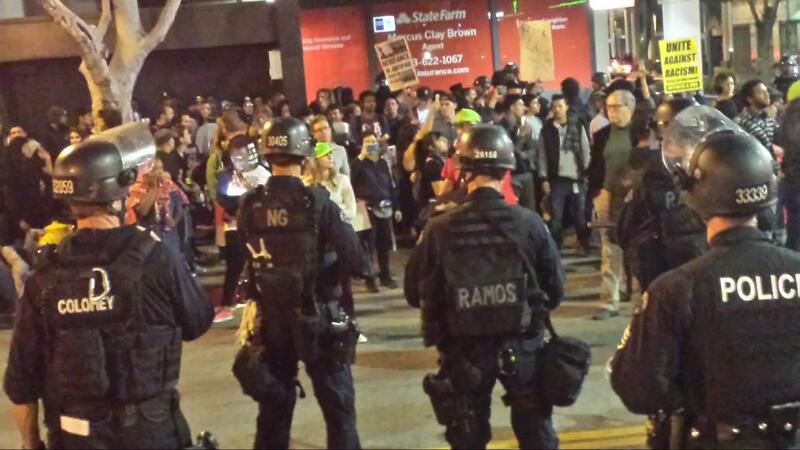 Some bottles may have been thrown at police, though the protests largely were nonviolent, KABC reported. Smaller protests sprang up Wednesday around the St. Louis area, where snow flurries had begun to fall earlier in the day. 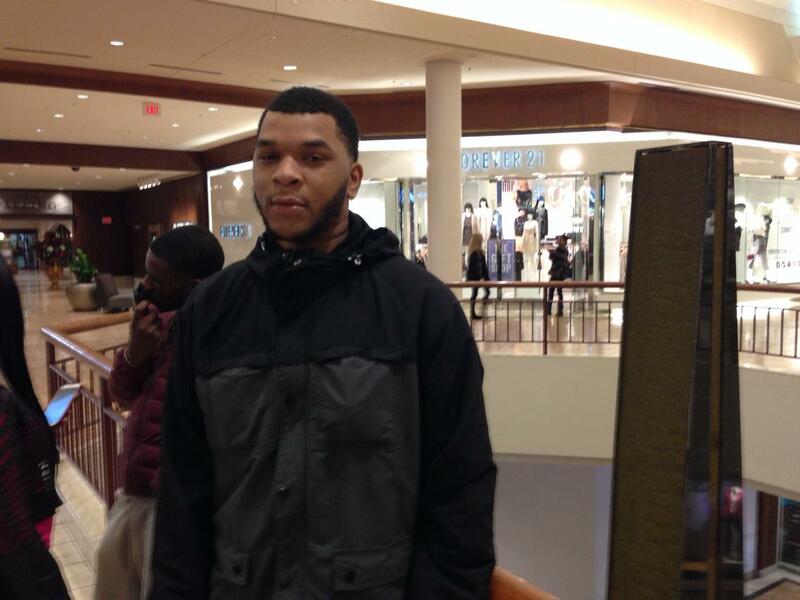 Trevion Ellis was shopping at Champs when he heard the protest. &#x22;I think it&#x27;s inspiring,&#x22; he said as it passed. Trevion Ellis was shopping at Champs when he heard the protest. "I think it's inspiring," he said as it passed. Another group protested against the police brutality faced by transgender people. 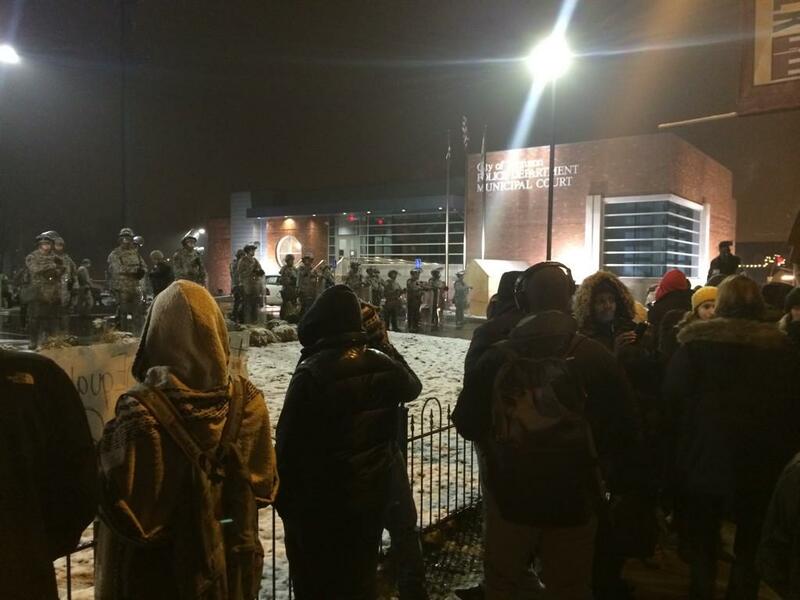 Meanwhile, some protesters also remained at the Ferguson Police Department. Two men who were arrested last week on suspicion of illegally buying guns near Ferguson may have had a plan to bomb the St. Louis Arch. The St. Louis Post-Dispatch reported that a source close to the investigation of Brandon Orlando Baldwin and Olajuwon Davis believed more charges would be filed against them soon. A number of media outlets reported last week the two had been involved in a bomb plot, but details were thin. According to the Post-Dispatch, the men bought what they believed to be a pipe bomb in an under cover law enforcement sting. They hoped to buy more bombs, but lacked the money to do so. 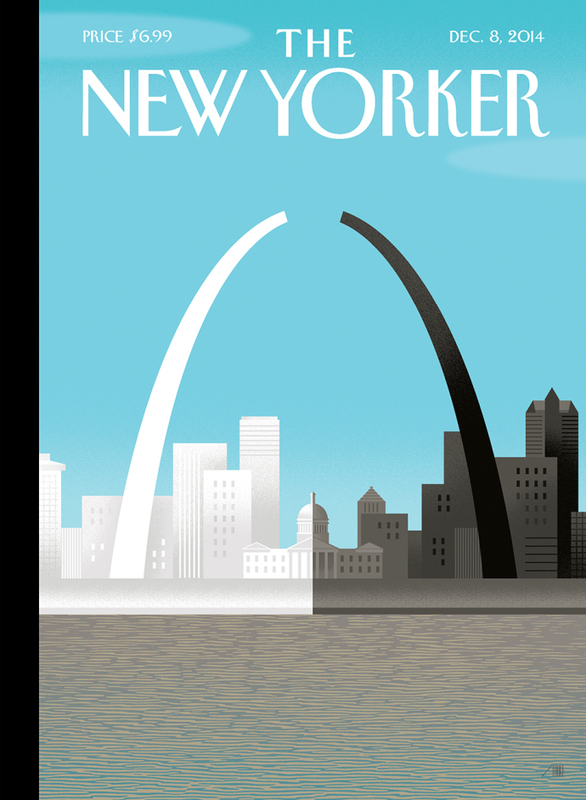 The two planned to target the St. Louis Arch's observation deck, the Post-Dispatch reported, but it was unclear if they could have gotten past security. The men were associated with the New Black Panther Party, and they pleaded not guilty on Tuesday. According to a local blogger, the two men told police they also hoped to target county prosecutor Bob McCulloch as well as law enforcement officers. A family member of one of the men told the Post-Dispatch that the charges were based on lies by authorities. Lawyers for Officer Darren Wilson said Wednesday he would not be returning to the Ferguson Police Department or any other. His lawyers spoke to The Washington Post on a number of topics. They said Wilson initially wanted to return to police work. "It took some time for him to realize that wasn't exactly going to be what happened," lawyer Danielle Thompson told the Post. An AR-15 rifle was taken from a police car on Monday, the St. Louis Post-Dispatch reported. The gun had not been found by Wednesday night, authorities told the newspaper. It had been in one of 10 police cars vandalized on Monday night. Gov. Jay Nixon's spokesman said Wednesday the governor would not appoint a special prosecutor to present the Ferguson case to another grand jury, the St. Louis Post-Dispatch reported. 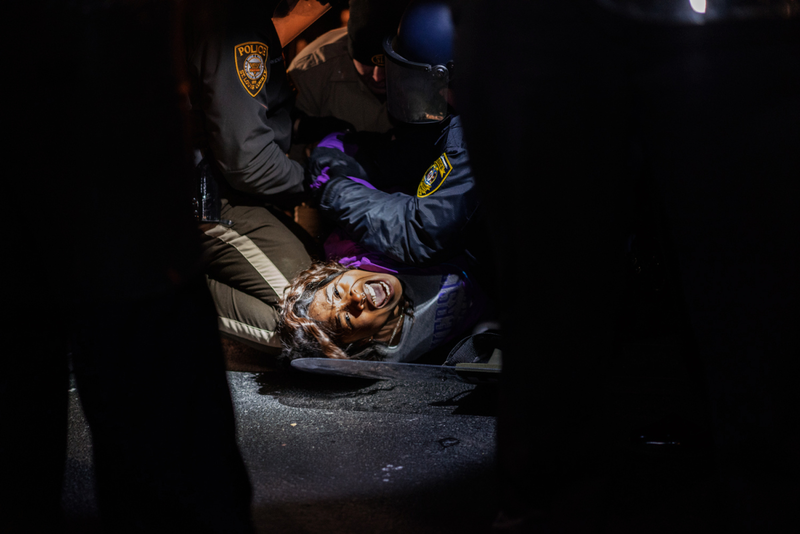 At least two people were arrested after hundreds of protesters stormed into Ferguson City Hall on Wednesday, CBS News reported. Those who made it inside City Hall were part of a group of about 300 protesters who marched and held a mock trial of Darren Wilson, the Ferguson police officer who shot and killed 18-year-old Michael Brown during an Aug. 9 confrontation in the St. Louis suburb. 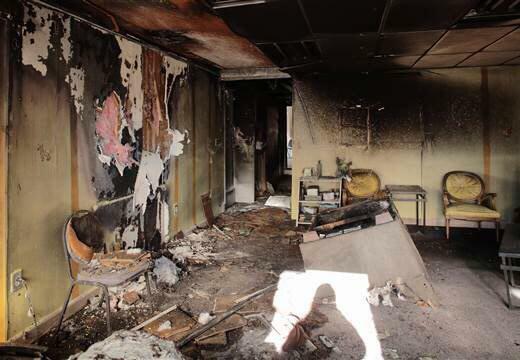 They burned our church down last night but God still reigns. We keepin&#x27; it moving. They burned our church down last night but God still reigns. We keepin' it moving. Protesters arrested after shutting down Los Angeles freeway. Police officers arrested seven protestors after abandoning their vehicles and shutting down traffic in both lanes of the 101 Freeway near Downtown Los Angeles Wednesday morning, said LAPD Officer Sally Madera. Around 9 a.m. local time, as many as 10 people were standing in the southbound lanes blocking traffic, according to the Los Angeles Times. Police officers began making arrests at approximately 9:45 a.m. By 10 a.m. local time, all lanes in both directs had reopened. In total, 183 people were arrested Tuesday night during protests in Los Angeles, authorities said. More than 100 people were arrested during protests in Los Angeles, officials told BuzzFeed News. Protesters gather outside the Los Angeles Police Department headquarters on Tuesday. Officer Darren Wilson's wife is pregnant, he told Good Morning America. He also said he wasn't sure he could return to the Ferguson Police Department. "I&#39;m not sure it&#39;s possible. I mean, you think they would accept me? You think it&#39;d be safe for me?" Wilson asked. Michael Brown's parents said Officer Wilson's first public comments add "insult to injury." Michael Brown's parents, Lesley McSpadden and Michael Brown Sr., spoke out against the grand jury&#39;s decision to not indict Darren Wilson on Wednesday morning network news shows. The parents told NBC&#39;s Savannah Guthrie that Wilson&#39;s first public comments add "insult to injury." Wilson said Brown instigated the incident by reaching for Wilson&#39;s gun and charging at him. Brown Sr. responded by saying his son respected law enforcement. "Who in their right mind would rush or charge at a police officer that has his gun drawn? It sounds crazy," he said. Wilson used words like "crazy" and "demon" to describe the way Brown looked before Wilson shot him. "It&#39;s disrespectful," McSpadden responded. She described the last 36 hours as "sleepless, very hard, heartbreaking, and unbelievable." Brown&#39;s parents also appeared on CBS This Morning to talk about Wilson&#39;s public comments. "I don&#39;t think he wanted to kill my son, but he wanted to kill someone," McSpadden said. The parents also commented on the number of protests happening across the county. "We don&#39;t condone it," McSpadden said while Brown Sr. asked for change. "We&#39;re just going to keep fighting and pray for a better outcome," he said. The family said it plans on pursuing the case in federal and civil court. The New York Police Department arrested 10 people in protests around the city last night, police officials told BuzzFeed News. 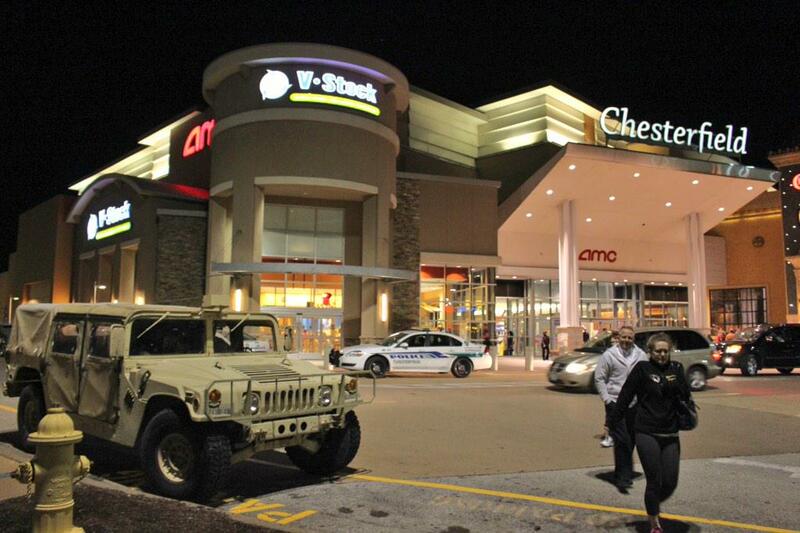 All of the arrests were for resisting arrest or disorderly conduct, a police spokesman said. There were no injuries. Two separate packs of demonstrators moved throughout the city, inspired by the activity in Ferguson. Some protesters moved from Union Square through the heart of Manhattan to Times Square. Others blocked the FDR Drive and marched over the Manhattan Bridge to Brooklyn. Protests in Times Square on Tuesday. Protesters shut down the Manhattan Bridge on Tuesday night. Protesters shut down the FDR Drive on Tuesday in Manhattan. Protesters marches in cities from coast to coast on Tuesday night into Wednesday morning. Protesters block the 101 Freeway in Los Angeles, California, on Tuesday evening. Two FBI agents suffered non-life-threatning gunshot wounds near Ferguson in an incicent not related to the protests, officials told KMOV. Gov. Jay Nixon increased the National Guard presence to 2,200 troops. Members of the National Guard wear their gas masks during a protest outside the Ferguson police station on Wednesday. There's no "typical" protester in Ferguson. Balita Hearn is not the typical attendee, but there are many like her and she illustrates the difficulty of pinning down a specific type of protester. Case in point: When several people started smashing windows Tuesday night, a chorus of other protesters drowned out the sound of breaking glass with shouts of "stop" and "don't do it." Tom Namako, Jon Passantino, Jason Wells, Claudia Koerner, Mary Ann Georgantopoulos, and Michelle Broder Van Dyke contributed to this report. Previous Updates On Unrest In Ferguson And Around The U.S.
Our previous reports from the protests in Ferguson, and updates from the rest of the U.S. can be found on this page.